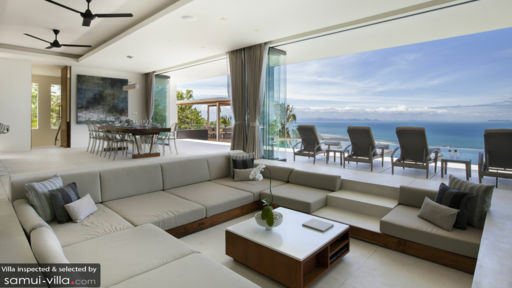 Villa Zest is a three-storey, vacation residence that features innovative tropical architecture. Interiors are appointed with contemporary and swanky furnishings, fixtures and pieces. At the same time, amenities are essentially of hotel and resort quality – to ensure each and every guest’s pure pleasure and indulgence. Constructed atop a hill high above Nathon Beach, Villa Zest extends to you sophisticated vacation living amidst a highland atmosphere. The villa has five bedrooms. Four of these have king beds, and one – the family room – has two queen-sized beds and two single beds. All bedrooms have dedicated bathrooms with rain showers. Four of these bathrooms, however, also have free-standing bathtubs. All bedrooms open out to furnished terraces or balconies with marvelous views of the coast and the seascape. 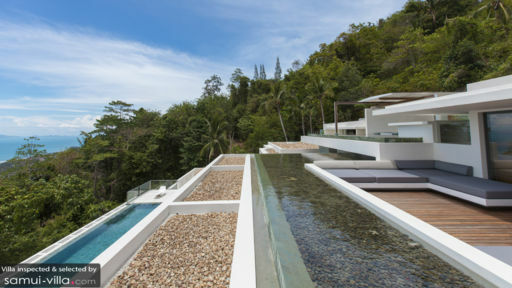 The centerpiece of the property’s exterior is the 18-meter infinity pool. Jump into its mesmerizing, glassy waters which appears to carry you out to the ocean. From the water, you can stretch out on cushioned, woven wood pool beds, or on a shaded, circular day bed on the covered terrace and on the stone deck. At the villa’s spacious, breezy and sunny common area are two living areas. The indoor living area – with its sunken, wide, wrap-around sofa facing a wall-mounted, widescreen TV – is on the semi-open ground floor. The alfresco living area – with its large and long sofas and chairs – is on the ground floor’s open-air, stone deck. There are also two dining areas. The indoor dining area – with its long, timber wood table that accommodates 10 – is also on the semi-open ground floor. The alfresco dining area – with its glass-topped table good for eight – is under the shade of the contemporized and scenic sala at one end of the infinity pool. Wherever you choose to dine at, you can all relish authentic local specialties – as well as Western staples – masterfully prepared by the in-house chef at the fully-equipped, ultra-modern kitchen alongside the indoor dinner table. Although the alfresco dining area is also ideal for cocktails and barbecue pool parties especially on breezy evenings. The kitchen also has a long counter, which provided with stools, can double as a bar. The villa also has a gym – with cardio machines, free weights and core strengthening gear – so you can still do your exercise regimen even when you’re far away from home. There’s also an office or study where you can, briefly, go on the grid to check ongoing jobs. Especially for the kids is a playground with a trampoline, a zip line and a treehouse. Tasked to render the regular villa services is a staff that’s comprised of a villa manager, chef as well as housekeepers and security personnel. Aside from a spa therapist may, upon your request, be called in. Their services, however, will be charged separately. Car rental is also available. Villa Zest is based – geographically – within Nathon Beach. From the villa, you can spend the day on the beach. Walk beyond the rock formation that divides the shore and you’ll find a deserted spot where you can go swimming – although keep in mind that, generally, swimming in these waters are not recommended from July to November. Then, get onboard a boat and explore Angthong National Marine Park. Make sure you get back before dusk so you can catch the sunset as you relish appetizing seafood specialties at the Sunset House. On your next day trip, head to the Elephant Jungle Sanctuaries Phuket for some really close encounters with these endearing creatures.